The holidays are a wonderful time to bring families together. What better way to do this than to start some new family traditions? Christmas Eve in our household signals the start of Christmas. If at all possible my husband tries to take the day off work and the grandparents are around so from when our kids were toddlers we’ve created family traditions that we do on Christmas Eve. 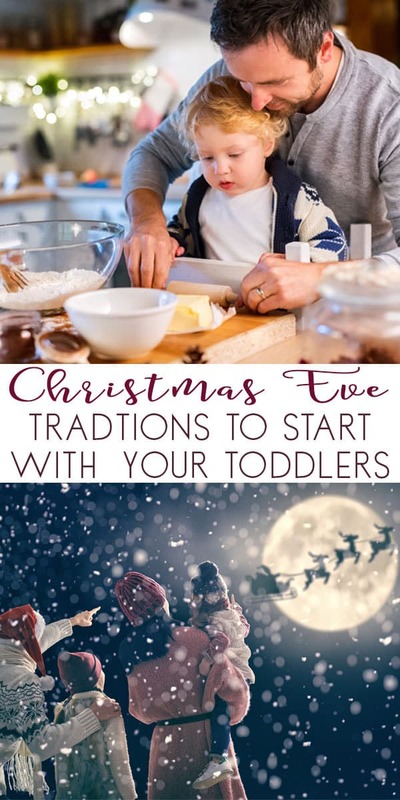 If you want to start something similar check out these inspirations for simple traditions for Christmas Eve that are ideal for your Toddlers and you to start this year. 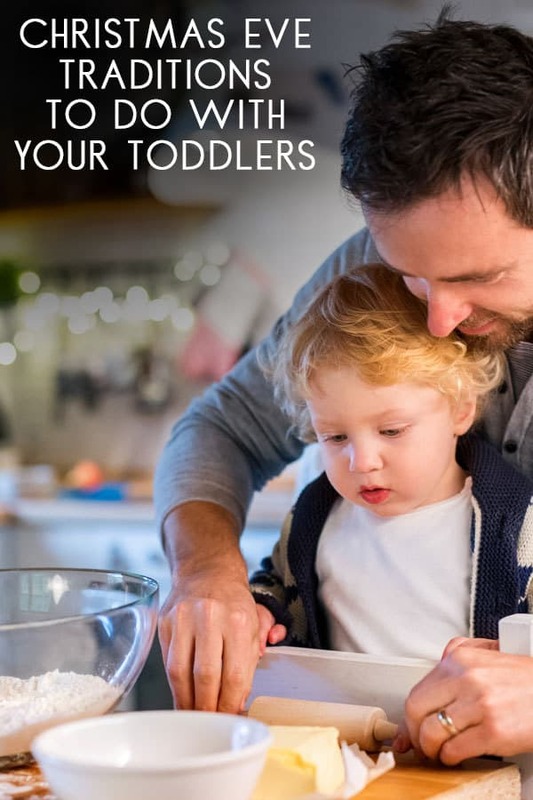 These simple traditions are things that we tried with our kids were toddlers and fitted around me cooking for the following days as normal. 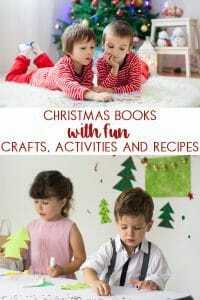 If you have older kids then check out our ideas for Christmas Eve Traditions for Families as there are some additional ideas that the older kids and you will find great to remember the giving nature of the season. 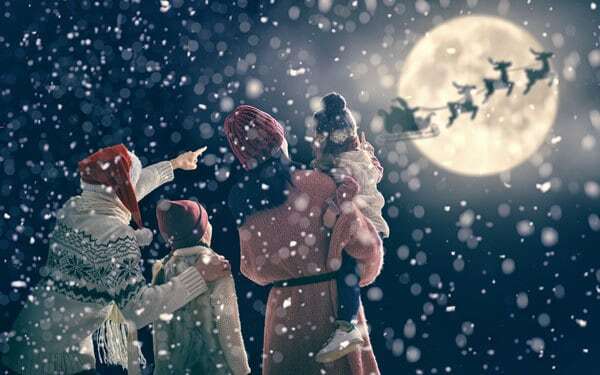 Santa needs his cookies to keep him full throughout his long night’s journey! 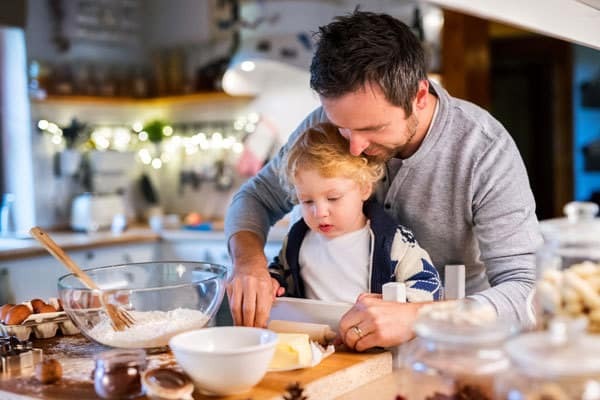 Be prepared to clean a messy kitchen, and bake some Christmas Eve cookies from scratch with your little one. 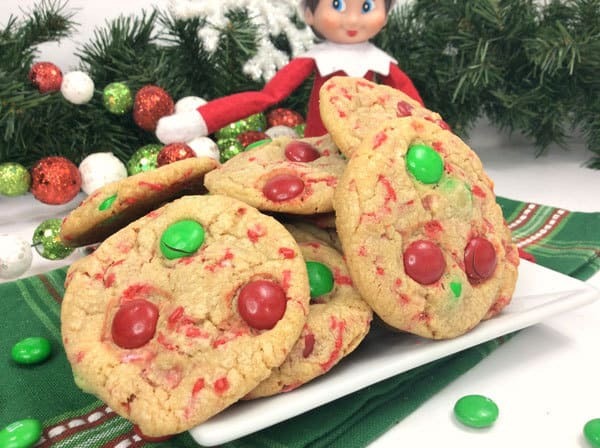 If you do Elf on the Shelf then why not let the Elf leave the cookie ingredients for you and the kids to cook that morning and then leave a couple of cookies out for Santa at the end of the day. You could alternatively bake some gingerbread cookies ahead of time and let your kids decorate them with writing icing and sprinkles. This is something that we have done and the grandparents loved joining in – although I think more cookies went in their stomachs than were decorated. When our two were toddlers we started a Christmas Eve Box tradition. We have a simple gift box that is reused year after year and inside fill it with little items that add to our family traditions year after year. If you are starting this for the first time then check out our Best Ideas for your Toddler Christmas Eve Box with simple things that you and they will get to have fun with together. What better way to spend time together than curled up on the couch? Pop in your kid’s favourite Christmas movie and take in all the snuggles while you can! Holiday movie watching is something the whole family will love and it doesn’t take a whole lot of work to get started. Check out this list of Top 10 Christmas Movies for Kids if you are not sure which Holiday Classic to pick to watch this year. Either head out for a walk if your neighbourhood has lots of lights to see and your toddler enjoys walking or it’s ok for them to be out in the cold in the stroller. Or head off in the car and visit some areas with fantastic light displays. See if you and your toddlers can spot some of the most noticeable Christmas characters – a snowman, Santa, star etc…. Snowball fights are fun no matter how old you are. 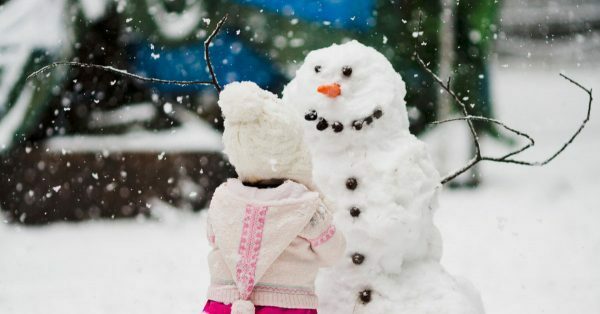 Dress up the kids in their warm winter weather gear and head outside for a snowball fight. Want to join in but there is no snow then don’t worry! Have a fake snowball fight. Craft your own snow or get away with throwing cotton balls around. Thankfully, little ones have wonderful imaginations! If like us you have included a Christmas Craft Kit in you Christmas Eve box then now is the time to sit down and do it. 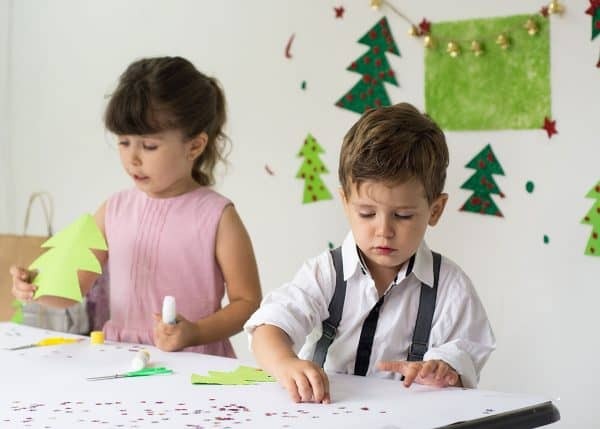 If not and you have some Christmas Craft supplies to hand then check out our simple ideas for Christmas Crafts for Toddlers there are plenty of ideas to choose from some of them that will only take a few moments to do and others that will keep the kids entertained for a while. Instead of counting down to Christmas with a chocolate Advent Calendar pick and choose from this classic Christmas books and share a craft or activity a day with your toddlers. 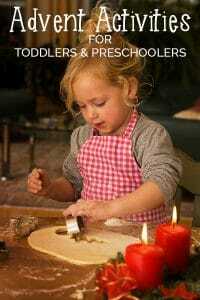 Another alternative advent to do with your toddler is our Advent Activities for Toddlers where each day we countdown with a simple activity like making Gingerbread cookies or writing a letter to Santa. 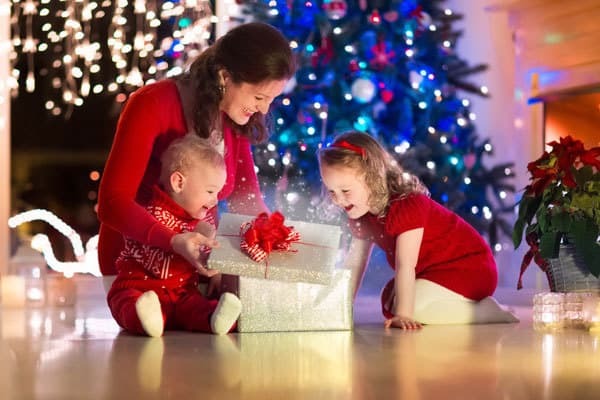 These memories will take hold and for years to come your kids will be asking to do these things as you spend time together as a family in the lead up to Christmas. 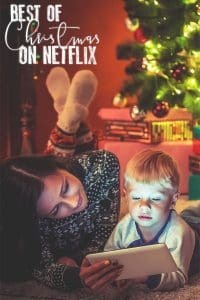 Snuggle up on the Sofa with your Toddler and watch Netflix with our pick of the best of Christmas on Netflix for the whole family.